All right, enough of this "not blogging" nonsense. I resolve to taste more whiskey in 2011! It will be difficult, but I shall endeavor to rise to the occasion. 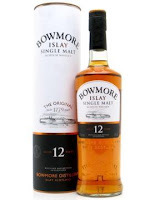 I've never heard a bad word spoken about Bowmore's offerings. Some of their older bottlings are highly sought-after, but tonight, we're just looking at their twelve year-old whisky...and it's no slouch. Peaty, for sure, but it wouldn't be much of an Islay otherwise, would it? Some orange, chocolate, and a bit of a vegetal scent and taste. A bit bitter in the finish, with coffee and more vegetalness...vegetality? It's an interesting drink, with lots of flavors there. The peat isn't as overpowering as it is in some other Islays, which is a nice change of pace. It's a nice dark amber color, too, which I like for reasons I can't express. I just think it's pretty, I suppose. And the price is pretty good, especially for an Islay. More notes to come in this new year! I hope all is well. I represent several wine and spirits brands and would love to send you more information on our clients.